Are you looking for a professional house clearance service in Enfield? You’re in the right place! 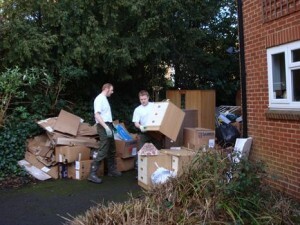 For over a decade Away With It have been providing house clearance Enfield locals count on and are happy to recommend. They appreciate our prompt, flexible and expert services and cost effective prices and we’re positive you will too! There are many different reasons why you might be looking for house and garage clearance services in the Enfield vicinity. You may be aiming to put your home on the market or planning a good clear-out of your garage, cellar or loft to create more storage space. Or perhaps you have just recently lost an elderly relative and need to clear their possessions so that the property can be sold off? No matter what your reasons Away With It can provide a hassle free, high quality house clearance service. Our dedicated and skilled employees will make light work of your house clearance and remove all varieties of contents, from unwanted clothes, soft furnishings, furniture and home appliances to old toys, sports equipment, books and CDs and diverse garage junk, saving you time and bother. As accredited waste transporters you can rely on us to complete a thoroughly professional job and dispose of any rubbish we remove legally, responsibly and ethically. We will always work closely with you to ensure that the job is accomplished with a minimum of disturbance and that only unwanted objects are cleared away. Our totally transparent pricing means the price we quote is the price you will pay. When you telephone to schedule your house clearance we will offer a free estimate that is fully inclusive of all labour, transport and disposal costs. Then on arrival we will carry out a visual inspection and quote a firm price. If you don’t want to go ahead for any reason there won’t be any call-out charge. Reservations are made in two hour slots and in most cases we are able to offer a same day collection service, including weekends and evenings. To ensure you’re not left hanging around we will always phone an hour ahead to let you know our precise arrival time. When the job is completed we will sweep up and leave the area spick-and-span. To talk with a member of our team about your needs for house clearance Enfield just phone us on 0208 504 7390 or 07957 123019. We are standing by to take your call 7 days a week from 7 in the morning to 11.30 at night and will be more than happy to answer any questions you may have and supply a free no obligation estimate. Alternatively you can contact us using our quick and easy online enquiry form and we’ll respond to you right away.